Much of surgery consists of intuitive decision making. This, in part, explains why patients seek out experienced surgeons. 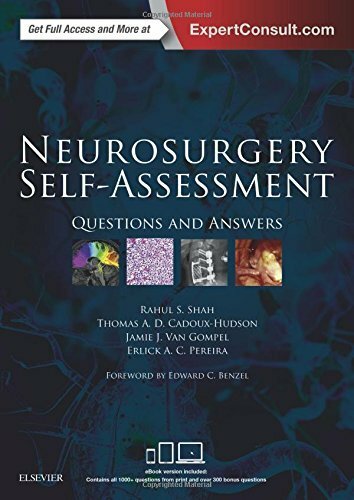 It is hoped that neurosurgical experience, be it personal, from reading or researching, or from observing others, creates a rich frame of reference to draw upon when making both clinical decisions and fine hand movements when manipulating someone’s brain or spine during an operation – or reacting to the unexpected. I have an interest in surgical education and there is a particular scientific literature on the amount of experience and cognitive processing of it required to transition from novice to expert which is quite intriguing. It’s often oversimplified to 10,000 hours – which is probably the clinical experience gained in a good British neurosurgical training programme, although no high quality studies have been done either to confirm this or the validity of the many tick box exercises that UK neurosurgical trainees now have to go through. I recently published a paper looking at clinical outcomes of surgery for spinal ependymoma, a particular type of common spinal tumour occurring intradurally (inside the dura mater lining the spinal cord and spinal nerves) and arising from ependymal cells that line the internal fluid spaces of the spinal cord. Optimising treatment strategies in spinal ependymoma based on 20 years of experience at a single centre. 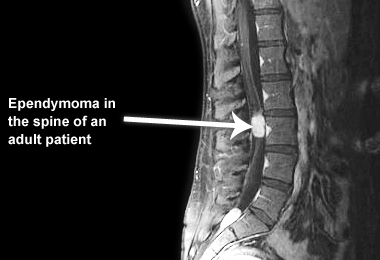 As a study of 61 patients with spinal ependymoma, it is one of the largest single centre studies published. We confirmed what many surgeons suspect intuitively – the more tumour that is removed, the better the patient’s outcome, both in terms of survival and improvement in leg power and function. On deeper analysis, the finding is not quite as intuitive as it sounds because the tumour surgeon’s dilemma is whether removing the last remnants of a tumour might damage normal functional neural tissue and cause a new deficit. This is a particular challenge in eloquent brain tumour surgery and numerous tools from special dyes and awake surgery to intra-operative stimulation, electrical monitoring and transcranial magnetic stimulation have been introduced to assist resections. The message is that careful and diligent gross, total resection of intradural spinal tumours remains desirable for best outcomes. This is something that I endeavour to do in my practice as a neurosurgeon and complex spinal surgeon. Transient, and unfortunately permanent, weakness remain risks of surgery on spinal tumours, but in my experience aggressive surgical resection confers best outcome. Routine radiographs one day after anterior cervical discectomy and fusion are neither necessary nor cost-effective. This refers to a particular type of surgery commonly done by myself and other neurosurgeons for slipped discs in the neck causing neck or arm pain or limb weakness called anterior cervical discectomy and fusion (ACDF). The surgery involves clearing out the disc space (ideally with a microscope! do please ask your spinal surgeon if they use one) and replacing it with a small cage made from a special plastic, PEEK, or titanium and bone graft or substitute. We showed that not doing X-rays one day after surgery not only reduced the patient’s stay in hospital by up to a day or two, but also reduced radiation to the patient and did not change their management. The tiny proportion of patients who had problems after surgery would have MRI scans ultimately. We estimated saving that department (neurosurgery at Oxford University Hospitals) close to half a million pounds a year with this service improvement audit. There are minor caveats to this practice. One needs to use X-rays during surgery to check that the correct level has been operated on and it’s good to do another X-ray 2-3 months later to confirm that the cage has fused the spinal bodies together. Not X-raying one day after surgery is best restricted to single and two level ACDFs as for multi-level constructs, knowing the shape of the neck and cage positions after surgery is desirable. I performed and published one of the few robust case series of three and four level ACDF surgeries without need for additional plating, together with one of my complex spinal surgery mentors, Mr Tom Cadoux-Hudson, a truly inspiring role model and great neurosurgeon who taught me many dexterous tricks during my Oxford neurosurgical training.